"No rulership or enforced authority." "Absence of government; a state of lawlessness due to the absence or inefficiency of the supreme power; political disorder." "A social state in which there is no governing person or group of people, but each individual has absolute liberty (without the implication of disorder)." "Absence or non-recognition of authority and order in any given sphere." Thomas Rainsborough: I shall now be a little more free and open with you than I was before. I wish we were all true-hearted, and that we did all carry ourselves with integrity. If I did mistrust you I would not use such asseverations. I think it doth go on mistrust, and things are thought too readily matters of reflection, that were never intended. For my part, as I think, you forgot something that was in my speech, and you do not only yourselves believe that some men are inclining to anarchy, but you would make all men believe that. And, sir, to say because a man pleads that every man hath a voice by right of nature, that therefore it destroys by the same argument all property -- this is to forget the Law of God. That there’s a property, the Law of God says it; else why hath God made that law, Thou shalt not steal? I am a poor man, therefore I must be oppressed: if I have no interest in the kingdom, I must suffer by all their laws be they right or wrong. Nay thus: a gentleman lives in a country and hath three or four lordships, as some men have (God knows how they got them); and when a Parliament is called he must be a Parliament-man; and it may be he sees some poor men, they live near this man, he can crush them -- I have known an invasion to make sure he hath turned the poor men out of doors; and I would fain know whether the potency of rich men do not this, and so keep them under the greatest tyranny that was ever thought of in the world. And therefore I think that to that it is fully answered: God hath set down that thing as to propriety with this law of his, Thou shalt not steal. And for my part I am against any such thought, and, as for yourselves, I wish you would not make the world believe that we are for anarchy. Oliver Cromwell: I know nothing but this, that they that are the most yielding have the greatest wisdom; but really, sir, this is not right as it should be. No man says that you have a mind to anarchy, but that the consequence of this rule tends to anarchy, must end in anarchy; for where is there any bound or limit set if you take away this limit , that men that have no interest but the interest of breathing shall have no voice in elections? Therefore I am confident on 't, we should not be so hot one with another. 1651 – Thomas Hobbes (Leviathan) describes the Natural Condition of Mankind as a war of all against all, where man lives a brutish existence. "For the savage people in many places of America, except the government of small families, the concord whereof dependeth on natural lust, have no government at all, and live at this day in that brutish manner." Hobbes finds three basic causes of the conflict in this state of nature: competition, diffidence and glory, "The first maketh men invade for gain; the second, for safety; and the third, for reputation". His first law of nature is that "that every man ought to endeavour peace, as far as he has hope of obtaining it; and when he cannot obtain it, that he may seek and use all helps and advantages of war". In the state of nature, "every man has a right to every thing, even to then go for one another's body" but the second law is that, in order to secure the advantages of peace, "that a man be willing, when others are so too… to lay down this right to all things; and be contented with so much liberty against other men as he would allow other men against himself". This is the beginning of contracts/covenants; performing of which is the third law of nature. "Injustice," therefore, is failure to perform in a covenant; all else is just. Anarcho-capitalist Murray Rothbard wrote in his work on early American history Conceived in Liberty that Pennsylvania was in a condition of anarchy after William Penn's original government collapsed. Meanwhile, we will hate Anarchy as Death, which it is; and the things worse than Anarchy shall be hated more! Surely Peace alone is fruitful. Anarchy is destruction: a burning up, say, of Shams and Insupportabilities; but which leaves Vacancy behind. Know this also, that out of a world of Unwise nothing but an Unwisdom can be made. Arrange it, Constitution-build it, sift it through Ballot-Boxes as thou wilt, it is and remains an Unwisdom,-- the new prey of new quacks and unclean things, the latter end of it slightly better than the beginning. Who can bring a wise thing out of men unwise? And so Vacancy and general Abolition having come for this France, what can Anarchy do more? Let there be Order, were it under the Soldier's Sword; let there be Peace, that the bounty of the Heavens be not spilt; that what of Wisdom they do send us bring fruit in its season!-- It remains to be seen how the quellers of Sansculottism were themselves quelled, and sacred right of Insurrection was blown away by gunpowder: wherewith this singular eventful History called French Revolution ends. I may be permitted here to express my personal opinion. I shall no doubt not be accused of not loving liberty, but I know that not all movements of peoples lead to liberty. But I know that great anarchy quickly leads to great exhaustion and that despotism, which is a kind of rest, has almost always been the necessary result of great anarchy. It is therefore much more important than we think to end the disorder under which we suffer. If we can achieve this only through the use of force by authorities, then it would be thoughtless to keep refraining from using such force. "As to those Englishmen that came as mechanics hither, very young and have now acquired good estates in Sugar Plantations and Indigo& co., of course they know no better than what maxims they learn in the Country. To be now short & plain Your Lordship will see that they have no maxims of Church and State but what are absolutely anarchical." In the letter Lawes goes on to complain that these "estated men now are like Jonah's gourd" and details the humble origins of the "creolians" largely lacking an education and flouting the rules of church and state. In particular, he cites their refusal to abide by the Deficiency Act, which required slave owners to procure from England one white person for every 40 enslaved Africans, thereby hoping to expand their own estates and inhibit further English/Irish immigration. Lawes describes the government as being "anarchical, but nearest to any form of Aristocracy". "Must the King's good subjects at home who are as capable to begin plantations, as their Fathers, and themselves were, be excluded from their Liberty of settling Plantations in this noble Island, for ever and the King and Nation at home be deprived of so much riches, to make a few upstart Gentlemen Princes?" After General Francisco Franco declared war on the Spanish government in 1936 (Spanish Civil War) the government lost control over much of Spain. Resistance to the rebels was often organized through the confederation of anarcho-syndicalist trade unions, the Confederación Nacional del Trabajo (CNT) and the Iberian Anarchist Federation, the Federación Anarquista Ibérica (FAI). The Spanish Revolution occurred almost immediately after the failed coup of Franco, leading to the formation of worker's collectives all over Republican Spain. This has been hailed as the best example of a functioning anarchist system. 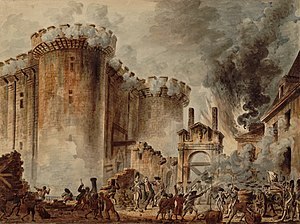 Anarchists were instrumental in keeping the country running and holding back the Francoists, until they were attacked by the Republican government and their Communist allies. The government was subsequently defeated by Franco, leading to 40 years of Francoist dictatorship in Spain. Before the Islamic Courts Union took control, large parts of southern Somalia were effectively functioning without a central government. However, an economic survey by the World Bank found that distribution of wealth in the country was more equitable, and the extent of extreme poverty was lower than that found in nominally more stable West African nations. According to the same paper, although southern Somalia was effectively operating without a federal government before the rise to prominence of the Islamic Courts Union, it was not an anarchist society in the sense that society was more or less chaotic than organized non-coercively. Despite this, a libertarian think tank reported that living standards in Somalia increased in absolute terms, relative to the pre-Somali Civil War era, and relative to other nations in Africa during this period. Economist Peter Leeson attributes the rather astounding increase in economic activity since the rise of statelessness to the security in life, liberty and property provided by Somali customary law — the Xeer — in most parts of Somalia, which insures for a relative free market. The Transitional Federal Government, internationally recognized as the government of Somalia, is allied with the Islamic Courts Union and the Alliance for the Re-liberation of Somalia, and backed by the United Nations, the African Union and the United States . It is currently battling various insurgent groups to regain control of the southern half of the country and restore national institutions. Every Neilien community is faced with two dangers, anarchy and despotism. The Puritans, especially the Independents, were most impressed by the danger of despotism. Hobbes, on the contrary, was obsessed by the fear of anarchy. The liberal philosophers who arose after the Restoration and acquired control after 1688, realized both dangers; they disliked both Strafford and the Anabaptists. This led Locke to the doctrine of division of powers and of checks and balances. Anarchists are those who advocate the absence of the state, arguing that common sense would allow people to come together in agreement to form a functional society allowing for the participants to freely develop their own sense of morality, ethics or principled behaviour. The rise of anarchism as a philosophical movement occurred in the mid 19th century, with its idea of freedom as being based upon political and economic self-rule. This occurred alongside the rise of the nation-state and large-scale industrial state capitalism or state-sponsored corporatism, and the political corruption that came with their successes. Although anarchists share a rejection of the state, they differ about economic arrangements and possible rules that would prevail in a stateless society, ranging from no ownership, to complete common ownership, to supporters of private property and free market competition. For example, most forms of anarchism, such as that of anarcho-collectivism, anarcho-communism or anarcho-syndicalism not only seek rejection of the state, but also other systems which they perceive as authoritarian, which includes capitalism, markets, and private property. In opposition, a political philosophy known as free-market anarchism, contemporary individualist anarchism or anarcho-capitalism, argues that a society without a state is a free market capitalist system that is voluntarist in nature. The word "anarchy" is often used by non-anarchists as a pejorative term, intended to connote a lack of control and a negatively chaotic environment. However, anarchists still argue that anarchy does not imply nihilism, anomie, or the total absence of rules, but rather an anti-statist society that is based on the spontaneous order of free individuals in autonomous communities. Some anarchist anthropologists, such as David Graeber and Pierre Clastres, consider societies such as those of the Bushmen, Tiv and the Piaroa to be anarchies in the sense that they explicitly reject the idea of centralized political authority. However, others argue that some tribal societies of the past have often been more violent than modern technological societies, on average. Some more recent anthropologists, such as Marshall Sahlins and Richard Borshay Lee, have defied the notion of hunter-gatherer societies as being a source of scarcity and brutalization; describing them as, in the words of Sahlins, "affluent societies". Adjudication by an armed authority appears to be the most effective violence-reduction technique ever invented. Though we debate whether tweaks in criminal policy, such as executing murderers versus locking them up for life, can reduce violence by a few percentage points, there can be no debate on the massive effects of having a criminal justice system as opposed to living in anarchy. The shockingly high homicide rates of pre-state societies, with 10 to 60 percent of the men dying at the hands of other men, provide one kind of evidence. Another is the emergence of a violent culture of honor in just about any corner of the world that is beyond the reach of law. ..The generalization that anarchy in the sense of a lack of government leads to anarchy in the sense of violent chaos may seem banal, but it is often over-looked in today's still-romantic climate. Some authors, such as Montague David Eder, question this vision of evolution, where humanity was able to reinvent itself in the last ten thousand years, to better fulfill its needs (see Myth of Progress). Anarcho-primitivists, such as Ran Prieur, believe that this concept represents a way that current culture justifies the values of modern industrial society and as a manner in which civilization was able to move individuals further from their natural necessities. Besides the consideration of authors, such as John Zerzan, of the existence of tribal societies having less violence altogether, he and other authors such as Theodore Kaczynski (also known as the Unabomber) talk about other forms of violence against the individual in advanced countries, generally expressed by the term "social anomie", that results from the system of monopolized security. These authors do not dismiss the fact that humanity is changing while adapting to its different social realities, but consider them an anomaly nevertheless. The two end results are (1)that we either disappear or (2)become something very different, distant from what we have come to value in our nature. It has been suggested by experts that this shift towards civilization, through domestication, has caused an increase in diseases, labor and psychological disorders. On the other hand, concerning the necessity of violence in the primitive world, anthropologist Pierre Clastres expresses that violence in primitive societies is a natural way for each community to maintain its political independence, while dismissing the state as a natural outcome of the evolution of human societies. Decentralism: Where It Came From--Where Is It Going? "anarchy." Oxford English Dictionary. Oxford University Press. 2004. The first quoted usage is 1850. Bertrand Russel's The History of Western Philosophy, pg. 555. See Steven Pinker's The Blank Slate, Chapter 4, The Noble Savage. Steven Pinker's The Blank Slate, pages 330-331. The Consequences of Domestication and Sedentism by Emily Schultz, et al.